Allow a tomato for each person; hollow them out and scallop the edges with a knife. Fill with a dressing made of equal parts of celery, green pepper and tart apples put together with mayonnaise. 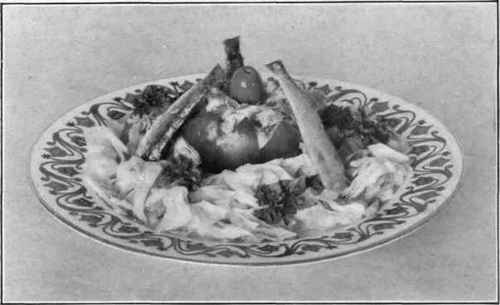 Arrange individually in nests of shredded lettuce, pour over a table-spoonful of French dressing to each serving and stand three sardines tent-fashion around each tomato. Allow a tomato to each person, hollow out and let stand in French dressing for half an hour in a cold place. Then fill with cucumber salad dressing, arrange on lettuce and stick tiny straws of cucumber into the cream. Peel the tomatoes. Remove a thin slice from the top of each, scoop out the centers, dust with salt and pepper, and invert the tomatoes in a cool place to drain. Fill these "cups" with a salad made of the chicken and lettuce stalks, moistened with mayonnaise, and arrange on plates for individual service. Garnish each with a spoonful of mayonnaise and a spring of parsley. Peel and chill the tomatoes. Slice the onion very thin crosswise, and shred the green pepper, after removing the seeds and core, and boil it two minutes. Drain and chill. Dress the crisped lettuce, arrange in a salad bowl; slice and dress the tomatoes, place upon the lettuce, and garnish with the onion and pepper. Remove the tomato skins by means of boiling water. Cut the fruit in halves and let marinate in the dressing for half an hour. In the meantime, mix together the chestnuts and celery, add a little of the dressing and let stand in a cold place to become seasoned. Arrange nests of shredded lettuce on individual plates, drain the tomatoes and arrange them on these nests in shape of a Maltese cross, put a spoonful of the celery and chestnut mixture in the center of the tomatoes, and serve with cream cheese sandwiches. Select medium-sized perfect tomatoes. Remove the skins and chill. 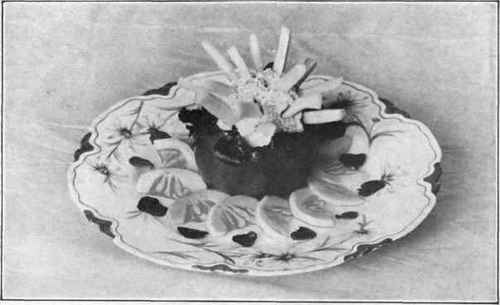 When ready to serve, cut each tomato to represent a flower, marinate fifteen minutes in French dressing, arrange on lettuce leaves or cress, dispose tiny balls of cream cheese in the center of each tomato and pass mayonnaise or boiled dressing.